The first and most important tip is to listen to your medical professional and wait for the green light to exercise again. Even if you’re undergoing physical therapy, it may be too taxing on the injured area to do more than those supervised exercises. As you heal, your physical therapist may provide you with exercises to do between sessions. Avoid setbacks by listening to that guidance — no matter how much you might want to do more. Then, when you are cleared to start working out, remember to take it slow. We understand the desire to “get back on the horse,” so to speak. But remember that your muscles and strength will have been affected by your injury and downtime. It’s important to listen to your body, especially in the early days of post-injury workouts. If something hurts, stop. Even if an exercise feels uncomfortable or “wrong,” heed those signals. It will take time to build up strength again, and rushing will only impede that progress. If you ever have concerns, call your doctor or physical therapist. Following on that first bit of advice, it’s a good idea to switch up exercise types. You’ll need to build up strength again, both in the injured area and throughout your body. Switching between different types of exercise is a good way to ensure your muscles and soft tissue are worked in a way that will help build strength, not just cause fatigue. Ask your physical therapist for suggestions based on your injury, but you should consider activities that provide a cardiovascular workout, build strength, and focus on stretching/flexibility. That mix will help you grow your abilities again while avoiding the muscle and joint issues that can arise from repetition of the same one exercise. One common way to injure (or re-injure) muscles is to push too hard before your muscles are properly warmed up. Take the time necessary to walk before you run — both metaphorically and literally! Walking before a run is a good, gentle way to get your blood pumping and your muscles warm before pushing them to work harder. The same concept carries over to stretching or strength training. Start with gentler stretches and build up to deeper ones, and start with a lower weight before adding on. After your workout, give your body the appropriate time to cool down, too. Slow your run to a light jog, then to a walk before finishing your workout. This helps your muscles avoid seizing up at an abrupt end to activity. This is also a good opportunity to do some stretching, to help ensure your muscles don’t tense up and cause joint issues. As you may imagine, warming up your muscles is an especially important step when recovering from an injury. The majority of that is how you ease into more strenuous activity. In addition to this, however, the way you dress can make a difference — particularly when it’s cold. Make sure exercise clothing that is appropriate for the weather to better protect your muscles. The other key element is to be sure you have good shoes for your workouts. 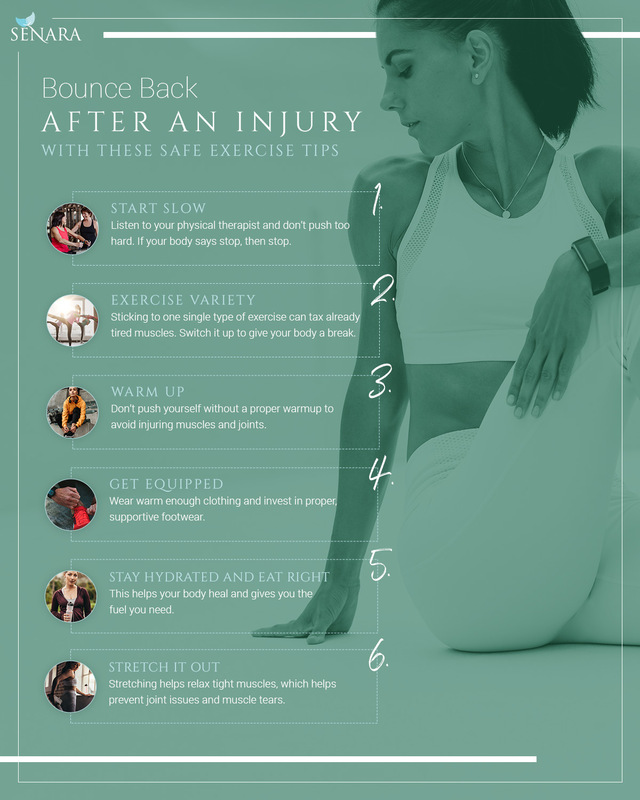 This is especially important for those recovering from foot and leg injuries, but it is also a key factor for anyone recovering from neck or back injuries. It’s worth a visit to a sports footwear store that offers gait assessment to find a pair of properly supportive shoes to better protect your body as you get back into exercising. You can also visit the Senara Health and Healing Center & Spa team for custom-modeled orthotics for the fit your feet need! Proper nutrition plays a big role in injury recovery and fitness. The fuel you provide for your body can impact how well or poorly it performs. This goes double for exercise after an injury because your body will be building strength and endurance. Remember to stay hydrated and focus on healthy foods to protect your joints and muscles. If you’re not sure what that looks like for your body’s physical needs, we suggest meeting with a nutrition counselor for a personalized dietary plan. As we mentioned above, stretching matters. In addition to post-workout stretching, it’s a good idea to incorporate yoga or other stretching as its own, balanced portion of your fitness routine. Stretching helps your soft tissue stay supple. This is especially important when you’ve worked your muscles hard, to prevent tight muscles from pressing against joints and affecting alignment. Massage therapy can further help loosen tight muscles and soft tissue. Whether you’re looking for sports rehabilitation specifically or more general injury recovery help, physical therapy is a great option for giving your body the well-rounded care and strengthening it needs to recover well. Connect with the physical therapy team at Senara Health and Healing Center & Spa in Peoria for whole-body care that includes physical therapy, massage therapy, chiropractic care, and more. Call today to schedule your consultation. ©2018 Senara Health and Healing Center & Spa ® - Do not copy. All rights reserved.